Have a minute?Watch our 60 second introduction video. Add Phone, Email, Live Chat, Text Messaging, and Skype to your website today! "It's 2019 and people want instant gratification. So give your customers the rapid service they want, on your terms. " Focus on what you do best, ConnectWithMe will handle the rest! 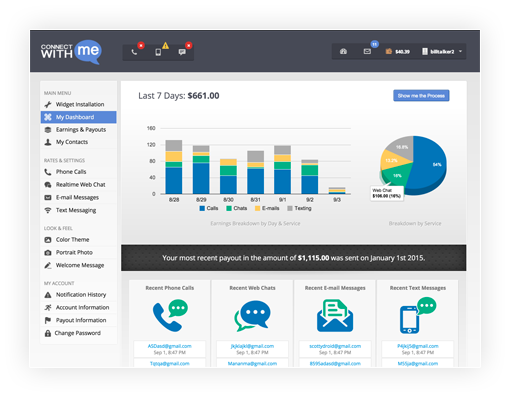 Offer phone, text messaging, live chat, email, and Skype in one spot to meet the preferences of your consumers or monetize your site to sell your advice, information, or services. Set your availability for each method and be contacted when and where you want. Set your own rates for each service or allow people to reach you for free, you decide. We handle the billing, as well as phone and email masking, freeing you up to support your customers or sell your information. Anyone can use our technology to provide paid communication without having to be face to face with a client. When your customers are as busy as you are, text messaging is often your best bet for communicating. Great for quick questions. Share your knowledge and advice with customers all over the world. Give advice, instruction, support to people who are in need of your professional expertise. With live web chat, your customers can get real time support online. Multiple chats at once is supported. Connecting with your customers over Skype video chat can offer face-to-face support in the comfort of their own home.